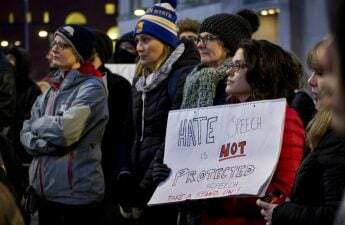 Earlier this month, the University of Wisconsin Board of Regents voted overwhelmingly to approve a policy allowing for the suspension and expulsion of student protesters who “interfere with” speaking events. The regents framed this crackdown on student protest as an effort to protect freedom of expression. In reality, it is already having the opposite effect — chilling campus speech and silencing voices of dissent. “It is not,” the policy document asserts, “the proper role of the university to attempt to shield individuals from ideas and opinions they, or others, find unwelcome, disagreeable or even deeply offensive.” Fair enough. Even if it were the place of the university to shield us from certain viewpoints, I frankly wouldn’t trust this administration, who recently refused to put a plaque on UW’s Abe Lincoln statue honoring Native Americans. Unfortunately, the policy won’t check the power of administration to moderate speech on campus. Rather, it gives administrators and outside speakers a monopoly on expression. The policy starts from the absurd premise that the rights of speakers on campus are threatened, and builds from there. The policy, and a nearly identical bill currently being considered in the state legislature, were ostensibly brought on by a protest to a Ben Shapiro talk at UW last November. Since that protest is often used by proponents of the “Free Speech Resolution” as evidence for the policy’s necessity, it’s worthwhile to clarify what exactly happened at that talk. 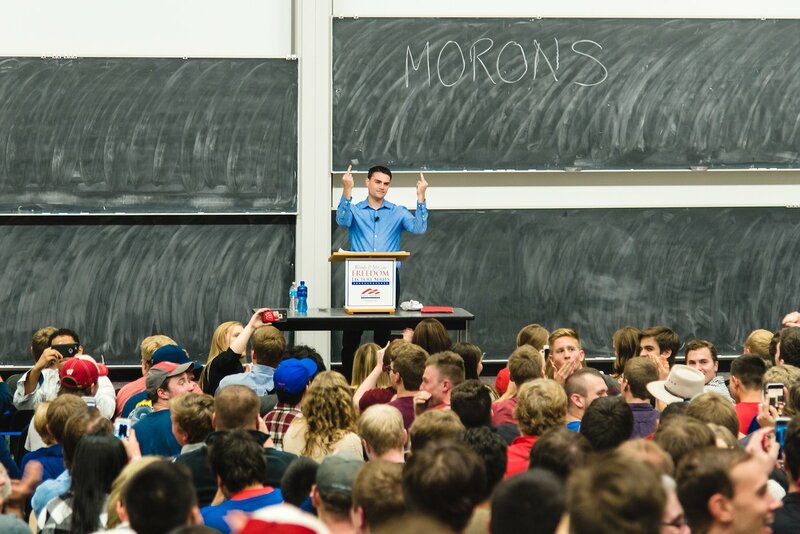 The UW student organization Young Americans for Freedom wanted to bring in conservative pundit Shapiro to give a talk. Students looking to voice their opposition to Shapiro’s message decided to organize a protest of the event. Organizers of the protest contacted the UW Police Department, and “established boundaries of what they could and couldn’t do, such as using megaphones or surrounding attendees.” They then conducted their pre-approved protest for between 10 and 20 minutes, before leaving as requested by Young Americans for Freedom leadership. The event reportedly continued without further interruption. Anyone who would suggest what those students did is somehow worthy of expulsion should never be taken seriously as a champion of free expression. While protesters made attendees of the event uneasy, they hadn’t violated any rules according to UWPD, and voluntarily left after a few minutes. Are we seriously to believe that this justifies a mandated expulsion policy and an orientation program on “free expression?” Both the policy and the orientation will absolutely have a chilling effect on free speech, which I have already seen firsthand. Since the vote by the Board of Regents, I monitored a protest of a recent YAF event which hosted conservative speaker Katie Pavlich. 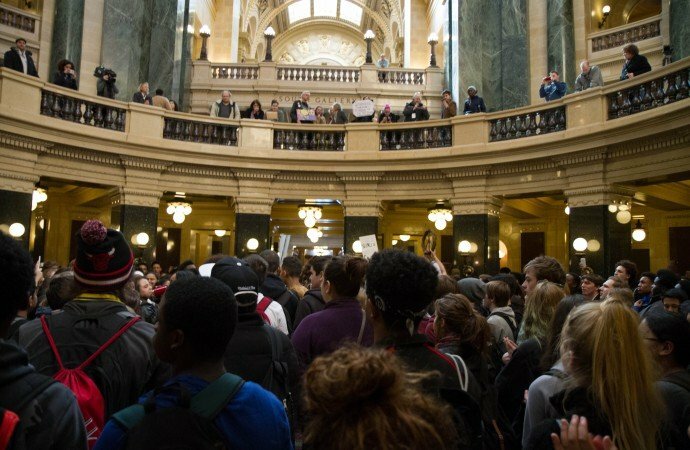 Although the organizers of the event had been in contact with UW administration and UWPD for some time, after the vote, they reached out to me with concerns about how the Board of Regents decision would impact their rally. Although they understood that the policy wouldn’t go into effect for a few months, multiple people said that they felt the need to be especially cautious in the wake of the Regent’s decision. I suspect this was the true aim of the resolution: To deter and quash student dissent. Let’s assume, for argument’s sake, that the “worst” of campus protests has yet to come. 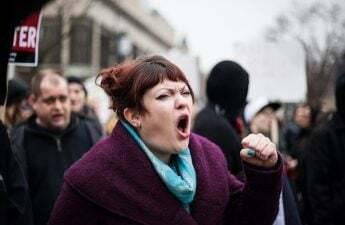 Perhaps there are plans for a group of overzealous activists to shut down any event that isn’t expressly Stalinist in character. Will this policy be adequate in securing the rights of expression for all on campus? Not by a long shot. The exact language of the policy would penalize students “found responsible for disrupting the expressive rights of others.” The term “disrupt” is never defined in the five-page draft approved earlier this month. Who decides what it means? Presumably, this would be up to the UW administration, for whom I have a healthy amount of skepticism. Worse yet, it may never be clearly defined, and the student body will be forced to second guess all of their political expression. If a student has to decide between holding their tongue during a Q&A and expulsion, the student will almost certainly pick self-censorship every time. I would. Even if asking a controversial question is permitted under the policy (it’s unclear as currently formulated), why risk expulsion? Even if we assume that the Board of Regents went in intending on protecting free expression on campus, we should still be alarmed by the implicit assumption that only the expression of speakers is worth protecting. Either through ignorance, malice or both, they decided that the chilling effect of their policy was acceptable. It isn’t. Campus activism matters and is entitled to robust legal and academic protection. The Board of Regents should reverse their decision immediately, UW Administration should voice their solidarity with the student body and the state legislature should abandon their version of the “Campus Speech Bill”. In the meantime, the rest of us need to apply pressure to the Board of Regents, administration and elected officials by making phone calls, emails and signing petitions. Shaadie Ali ([email protected]) is a senior majoring in geological engineering. He is also on the board of directors for the American Civil Liberties Union of Wisconsin.